Adana 8x5 Printing Press, originally uploaded by spoonergregory. We have a press! Hooray! Its an old Adana Eight-Five (this refers to the size of the printing area - 8x5ins) currently missing its rollers and in need of a little TLC. 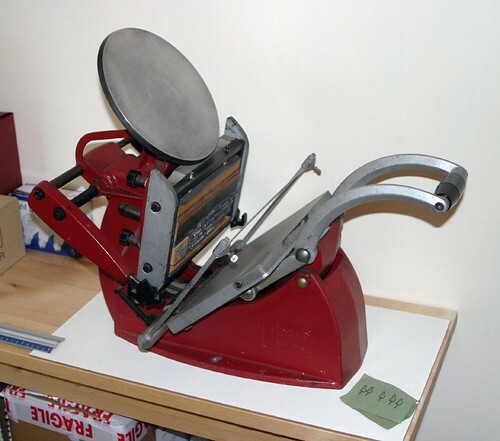 We're planning to use it to have a go at letterpress, which we've fancied for some time. We've already got a few fonts, most of which are now spread out across the dining room table while we sort them out. It'll also be used to print our engravings hopefully. We might have a go at that later this week if we feel brave enough.